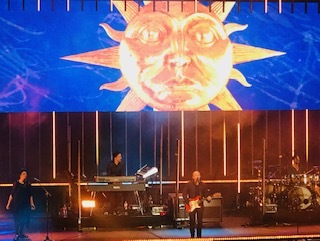 The Tears for Fears performance was much anticipated as the previous show had been postponed, due to illness, in May 2018. It was a completely packed house and the audience were lively as they waited to see Roland Orzabal and Curt Smith play the songs that helped them sell 30 million albums and win numerous awards. The band launched straight in to Everybody Wants to Rule The World, a bold move, some would say, to open with your biggest tune. It was a powerful start and the instantly captivated audience didn’t hesitate to get to their feet and were immediately taken back in time. The pop rock duo found mainstream fame in the early 80’s when their debut album, ‘The Hurting’ went straight to UK #1, with their following album, ‘Songs from the Big Chair’ reaching #1 on the US Billboard 200. Their performance at the BIC was powerful, with an abundance of artistic flair, they were playful with the audience and the strong bond between them both was evident. They fondly recalled how they had met as 15 year olds and could never have anticipated that they would still be playing together and thriving in 2019, with no intentions to retire! The pace of the performance was great as they avoided the traditional run of hits towards the end, familiar with so many arena acts, and instead ensured that a classic arrived every few minutes, much to the delight of the audience… Sowing the Seeds of Love, Mad World, Head Over Heels, Woman In Chains, Memories Fade’ and Suffer The Children, to name a few. Shout was the encore which was loudly requested by the audience!